When it comes to treatment options for bed bugs, there is either a chemical treatment or a heat treatment option. This page will provide you with all the information you need to know about our bed bug pesticide/chemical treatments. The main difference between the two treatments is how soon you’ll see results. A bed bug heat treatment will provide instant, same-day relief while a chemical treatment may take up to 30 days to eliminate all bed bugs. Why does a chemical treatment take up to 30 days? Because all living bed bugs must walk across our professional-grade pesticide. Recent bed bug eggs will hatch in 7 to 10 days and those new bed bugs must also come in contact with the pesticide. This entire process usually takes up to thirty days. 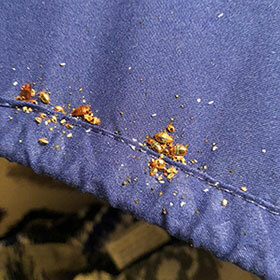 A chemical bed bug treatment is the cheaper option, but without a heat treatment, you do not get the immediate relief and may continue to see bed bugs and get bit during the 30 day period. We offer up to a 6-month warranty with our chemical treatments. For our heat treatments, we offer a 1-year warranty as long as the entire structure is treated. We perform bed bug treatments every day, and we don’t treat any other pest. 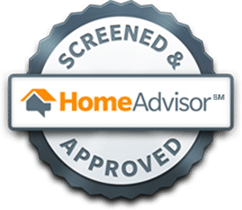 Whether you decide to go with a heat or chemical treatment, you will receive the best service from a licensed exterminator that specializes in bed bugs. 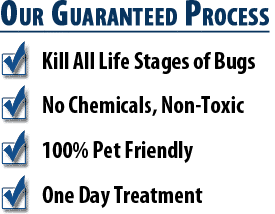 Our chemical treatments are pet and people friendly. In addition, we apply the pesticide in areas where people and pets will not come in contact with it. During treatment, all people and pets must be out of the residence for 6 hours after chemical application to allow the chemical to dry. Need Help Picking the Best Treatment Option? 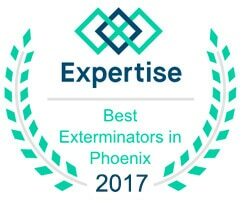 Phoenix Bed Bug Expert offers 100% free inspections and estimates. We will come out and provide a thorough inspection of the residence. This allows us to assess your level of infestation and provide an exact cost to provide our bed bug extermination services. To request a free inspection, call us at 480-351-6377 or visit our Request Estimate page.